We organize Kolyma Snow Sheep, Giant Moose, Caribou, Brown Bear hunt on the Northern part of Magadan Oblast – on the river Omolon, which is bordering with Chukotka region. This is absolutely unreachable area by ground transportation, and also there is very limited scheduled flights coming in. For our group of hunters we organize private Charter flights to local village Omolon. On arrival to Omolon 5 hour transportation by motorboat to main hunting camp. 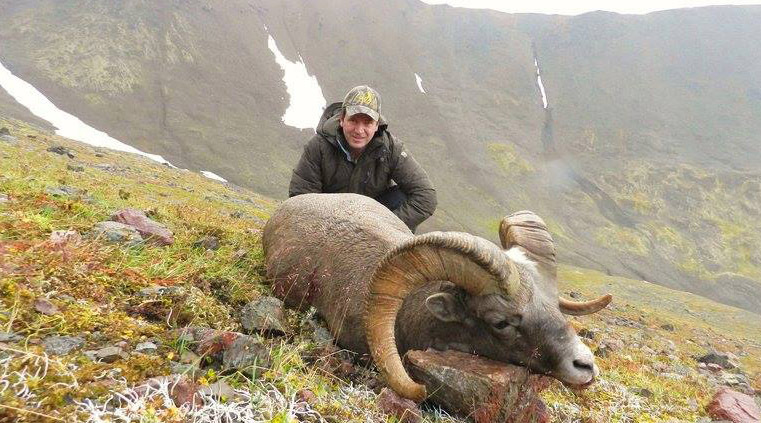 Okhotsk Snow Sheep is hunted closer to the cost of Okhotsk Sea. The same as for the Brown Bear, local transportation to main hunting camp by helicopter. Average flight duration is an hour – two (each way). Low altitude: 700-1000 meters above the sea level. Northern part of Kamchatka – Tilicheeky. After arrival to Kamchatka-Petropavlovsk local flight to Tilicheeky. Connected helicopter flight to hunting area. Sheep is hunted at the altitude of 1100-1800 meters. Yakutia or Sakha Republic is a vast unexplored region of Siberia in the northeast of Russia. It is one of the rare places on Earth, where spaces of wild nature – mountains, rivers, lakes, forests (taiga), northern steppes (tundra) are saved untouched by civilization. August from +5 to +18°C, September from +5 to -5°C, October from -10 to -15°C, November from -15 to -25°C. Hunting area is located to the Northeast of Yakutsk in Tomponsky District, at Verkhoyansk Range. The lowest point in the hunting area is 300 m and the highest – 2400 m above the sea level. Hunting covers the areas ~205 000 ha. On Arrival to Yakutsk, local charter flight to Khandyga town. Afterwards, transfer by motorboat 5-6 hours and off road vehicle (1st August – 10th October) OR off-road vehicle ~9 hours (10th October – 15th December). It’s also possible to book helicopter for a flight from Khandyga to hunting area. Hunter arrives to main hunting camp, which is equipped with dining area, Russian sauna, electricity and other. Each cabin can accommodate 2-3 hunters. Service staff and cook services are provided in the main camp. During a hunt, sometimes it’s necessary to stay in a tented camp. Sheep hunting method is exclusively on foot and by stalking. Hunter stays up on mountains till Sheep is taken. 11 day hunting is necessary for Sheep hunt. If combined hunting, then more days must be taken. During a snowy period we use snowmobiles for transportation on hunt. When there is no snow – hunting on foot or with horses from main hunting camp. Snow Sheep inhabit the rocky mountainous areas. Hunting method is exclusively spot and stalk. Hunter must be ready to do the distances up to 15 km daily. if there is no snow in area, then stalking is on foot, but when areas are in snow, then skis and snowmobiles are used. Hunting tour lasts for about 7-10 days.